"With any luck we’ll have an Indian summer, so, rather than a full-on crumble, I’ve gone for a refreshing ice cream. It’s the perfect finale for Sunday lunch." James Ramsden. 1. Put the cream, 100g sugar and the vanilla pod in a saucepan and heat, whisking gently until the sugar dissolves. Bring to the boil, then slowly pour over the egg yolks, still whisking, until combined. Set aside. 2. Put the apple in a saucepan with the blackberries, remaining sugar, and 1 tbsp water. Cover and cook over a medium heat for 10-12 minutes until the apple is soft. Place in a blender and blitz until smooth, then pass through a sieve. Removing the vanilla pod fi rst, mix the custard with the fruit pulp. Cover with clingfilm and refrigerate until well chilled. 3. Churn the mixture in an ice-cream machine following the manufacturer’s instructions, then freeze. Alternatively, freeze in a lidded freezer-proof container. After 2 hours, transfer to a food processor or blender and blitz until smooth, then return to the freezer. Repeat after 2 hours, then freeze until set. 4. For the crumble topping, preheat the oven to 200°C, gas mark 6. Place the flour in a bowl with a pinch of salt and rub in the butter with your fingers until it resembles breadcrumbs. Stir in the sugar, tip onto a baking tray and bake for 15 minutes until crisp and golden. Leave to cool. 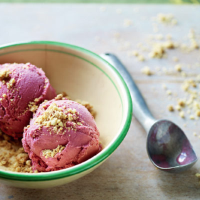 Serve the ice cream with a generous sprinkling of crumble.